Parents perceptions and early intervention - towards inclusive practice? This paper explores the experiences of early intervention for three families in England. The case study research considers parental perspectives and children's experiences of early intervention; what do parents want and what are children's experiences? In particular the ways in which parents and children participate in early intervention programmes in order to support learning will be explained. Case study data includes interviews with four parents. The early intervention experiences of three children with Down syndrome aged 3-4 years old will be described and placed within the context of early years and inclusive education policy and practice in England (QCA, 2000, DfES, 2001, 2003, 2004a,b, TSO, 2003). Recent recognition within Government policy towards increased parental involvement in the learning of young children will be considered within the context of inclusive education and early years policy and practice. The ways in which parents are encouraged to be involved in developing the learning of their children, and their support from professional services will be considered. The parents' views and experiences enable a conceptualisation of the implementation of policy and practice, in relation to the opportunities provided and the difficulties encountered. The tensions identified raise questions about whether parents are receiving the kinds of support they need and expect, and in particular whether suitable consideration has been given to the pedagogic models being applied through early intervention programmes. Phonology has been shown to be an area of difficulty for children with Down syndrome (Dodd & Leahy, 1989), but little is known about the nature of the impairment. Studies of phonological development in this population have concentrated on productive skills without assessing the skill which precedes this, the capacity for perceiving phonological contrasts and structure. The need for information on this fundamental aspect of speech processing becomes even more pressing in light of the literature on phonological perception in children with specific language impairment, where problems with the perception of phonology have been found (Leonard et al., 1992). We present two studies which aim to compare the production and perception of phonology at the word level. The phonological variables we investigate, word initial weak syllables ('ba' in 'banana') and non-word initial stress ('nana' in 'banana') are known to cause problems for language impaired children and are acquired late in the development of phonology. We used a non word repetition task to assess production of phonology and an XAB non word discrimination task to assess phonological perception. Two groups matched on receptive vocabulary age participated: children and adolescents with Down syndrome and typically developing children. Preliminary data collection suggests poorer processing of weak initial syllables for the group with Down syndrome. This presentation provides a brief overview of the literature relating to the cognitive status of individuals with Down syndrome across the lifespan. Implications for individuals who now have a life expectancy similar to that of the general population is explored, as are the effects of programmes of early intervention and factors which appear to limit progress. How to support the development of individuals in the future is discussed. Why should we wish to know about the cognitive development of individuals with Down syndrome - across the lifespan or for that matter, at any other given point with in it? The reasons one suspects are many, but from an economic and service delivery perspective, research may highlight optimum periods (or not), for interventions which could affect the timing, frequency, quantity and resulting effectiveness of whichever 'therapeutic process' is in mind. From an academic perspective researchers may consider similarities and differences in relation to other conditions such as Specific Language Impairment (Laws and Bishop, 2003), Autism (Rasmussen, Borjesson, Wentz and Gillberg 2001; Reddy, Williams and Vaughan 2002) and Alzheimer's Disease (Teipel et al, 2003; Mann, Yates, Marcyniuk, and Ravindra 1986; Schupf and Sergievsky 2002; Dalton and Wisniewski 1990; Janicki and Dalton, 2000). The findings contribute not only to theoretical perspectives, but should also inform practitioners and policy makers how best to support the development and longer term care of individuals with Down syndrome. In modern Russia the number of children with disabilities has increased twice during recent years. Under these circumstances Early Intervention becomes a priority in modern special education in my country and international experience has aroused great interest among Russian professionals. Physiotherapy is a relatively new profession in Russia. Since 1992 physiotherapy methods have been introduced in Russian special education by development of international co-operation. Since 1996 The British-Russian Charity "Downside Up" has been supporting families with Down Syndrome children in a variety of different ways. Now over 600 families are enrolled in Downside Up EI Programmes based on using results of combination of Russian and foreign research adapted to Russian conditions. Downside Up offers multi-disciplinary services and uses the principles of physiotherapy. Since 2002 DSU has been implementing a long-term Russian-Dutch Project named "Introduction of New Method in Physiotherapy for Enhanced Motor Development in Children with Down Syndrome in the Russian Federation." The Dutch partner is 's Heeren Loo-Lozenoord, a comprehensive institution in the field of care and counselling for the people with learning disabilities in the Netherlands, including Peter Lauteslager, child physiotherapist who received a PHD for his research into motor development and treatment of young children with Down syndrome. His research resulted in a new method for motor skill development applied to the 0-4 age group. This project which was launched under the Russian Government, Embassy of the Netherlands, Fund "Up with Down" has been extended in 6 regions of Russia. More than 80 professionals in Moscow, Nizniy Novgorod, St-Petersburg and Samara have attended the Russian- Dutch training and apply this method to their every day practice. The project outcomes will be distributed to the other regions of Russia and contribute to the development of care for children with Down syndrome. This paper raises questions about what models of children's learning are embedded in early intervention programmes and that different pedagogical approaches may affect children's learning situation. An holistic curriculum, based on play, and active learning, with children's learning evaluated through narrative learning stories could be considered to be an alternative approach to what Bridle and Mann (2000) describe as the 'functional diagnostic model' of supporting young children with learning difficulties or disabilities. Within a climate of inclusive education, could alternative ways of approaching early intervention programmes and models of children's learning and assessment be considered to be more appropriate? This paper presents parents perspectives of how they consider their children with Down Syndrome learn in the early years. Dinnebeil and Hale (2003) note how professionals should share the setting of goals and the evaluation of early intervention programmes with parents. However, some of the parents interviewed in this study found the expectation to work towards the achievement of 'goals' through the setting of tasks was problematic. This suggests that current task lead approaches to early intervention may not be ideally suited to many parents now being encouraged to engage in programmes to support their child's learning and that these tensions should be identified, acknowledged, and addressed in order to support the child's learning. The paper will present the results of two studies which investigate linguistic and cognitive abilities in children and adolescents with Down syndrome. The first study investigated syntactic abilities and forward and backward word span in adolescents (n=20; mean age=15;10) who differed in a text reading comprehension test. The results showed that skilled text comprehenders outperformed less skilled ones in backward word span, which requires both storage and processing of incoming linguistic information, but not in forward word span that requires only passive retention of linguistic information. Both skilled and less skilled text comprehenders showed poor syntactic abilities. In order to further investigate the linguistic pattern of readers with Down syndrome a second study was carried out. The aim of this study was to investigate whether individuals with Down syndrome who have developed reading skills and individuals who have not showed different linguistic profiles or not. A group of individuals with Down syndrome which had developed reading skills (n=12; mean age 12;9) was compared on a listening text comprehension, word comprehension and sentence comprehension with a group of individuals which had not developed reading skills (n=9; mean age 9;4) and with a group of typically developing readers matched on text reading comprehension (n=12; mean age 6;9). The results showed a better performance of readers with Down syndrome compared to non-readers with Down syndrome in word and listening text comprehension. There was no difference in sentence comprehension. Furthermore, readers with Down syndrome had similar linguistic performances in word and listening text comprehension but poorer sentence comprehension abilities than children with typical development. The readers with Down syndrome seemed to show a linguistic pattern more similar to children with typical development with same comprehension than to non-readers with Down syndrome. Children, adolescents and adults with Down syndrome have often experienced harassment, abuse, victimisation, and loneliness through lack of friendships. Personal and Social Development is the most critical aspect of curriculum for the student, and life skills for the adult with Down syndrome. Providing appropriate Personal and Social Development programs respects the right of these young people to access and participate safely and with dignity in their community. All individuals have the right to access the programs at their level of understanding. For the individual with Down syndrome, this means considerable adaptation will be required to current programs that include content, language, presentation and materials. RIGHT TO KNOW addresses the specificity of the learning styles of people with Down syndrome, and provides a comprehensive resource kit for personnel to implement appropriate programs about personal safety, human relationships, sexuality and friendships. This presentation will describe the development of a parent-held record for parents of babies and preschoolers with Down syndrome as part of the UK Early Support programme (http://www.earlysupport.org.uk/). Based on a detailed developmental record already designed for deaf babies and young children as part of the Early Support programme, a multi-disciplinary team led by staff at The Down Syndrome Educational Trust are engaged in producing a similar tool for families with children with Down syndrome. and it is to be used by their key-worker and early intervention team, who can support families to make full use of the record as needed. After a year's work in consultation with families and an advisory group of professionals, we are now about to trial the record, which we are now calling a Developmental Journal. Research tells us that early intervention is only effective when parents are the main players, that is, when professionals pass their skills and knowledge to parents and parents can then intervene effectively to promote their children's development. This means that parents may need to understand infant and child development in more detail than they need for a typically developing baby. One of the aims of this journal is to support them in this venture. We illustrate the draft journal and explain the next steps to producing the final version. We have been involved in longitudinal studies of visual development in children with Down syndrome since 1992. 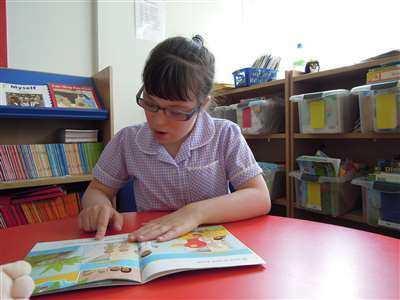 We have shown that many more children with Down syndrome become long-sighted and near glasses than do typical children. One of our major findings is that about 75% of children are inaccurate when focusing on near tasks, even when they wear glasses to correct long-sight. This means that near work is significantly out of focus and this deficit must impact on learning. We have compared vision in 27 children who focus accurately with 27 children who are consistently inaccurate. Children with inaccurate focusing are more likely to need glasses for long-sight and more likely to have a squint. Thus, accurate focusing is associated with a more normal development of the eyes. Our recent study has shown that children with inaccurate focusing benefit from wearing bifocal lenses. Two matched groups of primary school children took part, with one group wearing bifocals and the other control group wearing conventional glasses. Focusing was accurate in the children wearing bifocals, while remaining inaccurate in the control group. For some children, bifocals may be a temporary measure since they appear to trigger better use of their natural focusing ability and the children can return to conventional glasses. This raises the question of whether early intervention with bifocals will help overall visual development in children with Down syndrome. Some people with Down syndrome are profoundly deaf. Families of deaf people with Down syndrome have struggled to find advice and resources that are closely matched to their needs. They have found themselves swinging, or falling, between the deaf world and the world of learning disabilities. This poster presentation gives parents of profoundly deaf people with Down syndrome a chance to be heard. Based on interviews with 5 sets of parents, it presents their personal thoughts and experiences. A profile of the young people themselves is also given. The interviews focus on communication and social development, and access to support and services. The poster also presents a challenge to researchers to investigate more fully the impact of Down syndrome on the development of sign language. The pattern of reaction times obtained by children with Down syndrome (DS) in magnitude comparison tasks using dots, lines of differing length, and digits as stimuli was compared to that obtained by typically developing children in Year 1 and Reception classes. The children with DS and the typically developing children had similar receptive vocabulary levels. The children in Year 1 demonstrated typical distance and magnitude effects in all tasks. The speed with which they made magnitude comparisons using line and digits as stimuli correlated with their performance in the addition tasks. This interrelation between speed in comparison between numeric and physical stimuli and addition skills suggests numeric representations in this group are underpinned by analogue magnitudes, which in turn support addition skills. The children with DS and children in Reception also demonstrated typical distance and magnitude effects in all tasks, although five children with DS had to be excluded from RT analysis of the numeric comparison task due to low accuracy. This suggests that analogue magnitude information also supports numeric representation in these groups. Although group sizes were too small to make firm interpretations of the pattern of correlations achieved in these groups, speed in making magnitude comparisons using dot arrays was the only correlate with addition performance. For many years the Italian Association for People with Down Syndrome, Section of Rome (IDPA) has offered various services of information and consultancy to people with Down syndrome of all ages and their families. This poster presents details of parent support groups which have been taking place at IDPA for two years. The objectives of this experience were: discussing problems about Down syndrome; sharing experience among parents; thinking about new educational strategies for children; making use of parent's abilities; and increasing formal and informal social support networks. Two support groups of 7 couples of parents each were formed, being divided on the age of children (4-6 and 7-11 years old). Groups of parents meet once every month, together with a psychologist (leader of the group) and an observer. At the end of the experience, the authors evaluated the results of the intervention through an individual questionnaire and a group interview. The discussion about results demonstrate the efficacy of the experience through 4 factors: identification with other members of the group (M=2,9), sense of responsibility about the situation (M=2,4), exchange of information and advice (M=3,1), and friendly support (M=1,9). Moreover, the participation in the group increased in parents: individual styles of coping, self-efficacy, sense of empowerment and style of communication. Differences between the two groups were also explored. This study, for its theoretical, empirical, and ethical rationales, represent an intervention of social work in the Community Care perspective; offering the families and people with Down syndrome an experience to increase their own resources and to improve their quality of life. In addition, the implications of such an approach are related to the promotion of health not only for families involved in the intervention, but also, consequently, for formal and informal social support network and the community. This poster will outline service delivery to Infants and pre-school children with Down syndrome. Six years ago, in response to early identification and referral of infants with Down syndrome it was necessary to re-evaluate the speech and language therapy service delivery models to this group. As a result of raised awareness among medical and nursing staff of the role of the SLT, all babies within NHS Greater Glasgow area diagnosed with Down syndrome are referred to our department often within the first few days of life. This service is supported by lead clinicians in Down syndrome and AAC. The poster will describe the following: the Aims of the Early Intervention service, the Model of Service Delivery employed and details of the training provided for parents/carers/siblings and other interactive partners i.e. nursery staff and extended families. As well as outlining the service the poster will include the outcomes of an audit of parental perceptions of the speech and language therapy service. Research into the effect of intervention on motor develop-ment of children with Down syndrome has encounte-red problems in the field of theoretical foundation, choice of measuring instrument, treatment concept and research design. To meet these problems a treat-ment method (i.e., 'Physiothe-rapy for young children with Down Syndrome') has been introduced based on the theoretical framework 'Disturbances in the system of postural control' (Lauteslager, 2004). In addition, a disease-specific evaluative instrument, 'Basic motor skills of children with Down Syndrome' (BMS), has been developed to assess changes in basic motor skills of children with Down syndrome (0 to 3 years old). In this presentation the theoretical and practical background of the physiotherapy method will be highlighted as well as an intervention study that was carried out with regard to the effectiveness of the method. An interventi-on study was carried out with 18 children with Down syndrome (age range: 9-47 weeks). A quasi-experimental time series design (ABCBC) was applied consisting of: A. a baseline period of 2 months; B. two treatment periods of 3 months; C. two rest periods of 3 months. In total the intervention lasted 14 months. Changes in basic-motor skills where assessed with the BMS before and after each period. Changes in BMS-score after the treatment periods were compared with changes in the baseline and rest periods. Motor development in both treatment periods turned out to be significantly faster than in baseline and rest periods (MANOVA analysis). The physiotherapy treatment resulted in a positive effect on the development of basic motor skills of young children with Down syndrome. It is argued that this effect is due to an improvement of inadequate elements of postural control, such as stability and balance. López-Moratalla López A, Caballero Blanco J, Barbero Olvera J & Macias Domínguez M.J. This poster is based on the reflections and diary records of a team of early intervention professionals who work for the Asociación Síndrome de Down de Granada, Spain. Children with Down syndrome have a range of difficulties in health, attention, motivation, behaviour, language and speech, autonomy and generalization, therefore we propose several strategies that are useful for us during individual sessions of early intervention. These can also be used in school, family and social situations, not only to acquire knowledge, but also to generalise and have educated behaviour skills in any situation. What we propose is not a rule. The same strategy is not useful for all because each child is different and has particular characteristics. It is necessary that the children have the capacity to interaction with us and with the different contexts that are around them. We recommend getting parents to became an active element during early intervention process because children spend most of the time with their families. We pay special attention to affective interactions and emotions of everyone who lives together with a child with Down syndrome, because it is essential for the success of the program. Background Intellectual disability (ID) is characterised by cognitive deficits with very different clinical characteristics. Findings from neuropsychological research have defined different cognitive profiles among people with ID of different aetiologies. With respect to numerical and calculation abilities in individuals with ID, the data often reported in the literature confirm only a general difficulty. The aim of this study was to describe these abilities in individuals with different types of ID: individuals with Down syndrome (DS) and individuals with Williams syndrome (WS). Methods Two groups of persons, individuals with DS and individuals with WS, were compared on the basis of mental age (DS: range 5-6.6; mean 6 years; WS: range 5-7; mean 6.8 years), chronological age (DS: range 12.8-30.3; mean 18.11 years; WS group range 8,6-29,5; mean 16,6 years) and reading numerals (mean 6.10 for both groups). Tests of intellectual ability were given as well as an experimental diagnostic protocol to evaluate numerical and calculation abilities and tasks of operating with a pocket calculator. Results Our data show that individuals with WS performs better than individuals with DS on the number system; however, in calculation the performance differences observed in the two groups were not significant. More specifically, individuals with DS have generalised difficulties to perform all the numbering and calculation tasks; individuals with WS had a more a-typical profile in which some abilities are impaired and others, which are relatively preserved. Conclusions The present study demonstrates differential patterns in numerical and calculation abilities in people with ID of different aetiologies. Abilities related in calculation seem to be linked to higher cognitive processes as they require simultaneous control of more than one element, including the ability to abstract and make inferences. However, numerical abilities appear to be influenced by other, more specific factors such as working memory. Up until now only few studies have investigated academic abilities in Down syndrome (DS) children. However, the small number of papers that concentrate their attention on reading abilities of this population often reach contradictory results. Our exploratory work aims to provide systematic knowledge about the organization of writing abilities, a complex cognitive process never studied in Italian speaking population of persons with DS. To test writing skills in 12 individuals with DS and in 12 typically developing children (matched on the basis of their reading age), a battery of several tasks was administered. The individuals with DS people showed a good knowledge of the Italian conventional writing system, being able to write correctly their name and surname and simple words. Relative to their controls, a lower level of orthographic rules appeared in writing word and non-word and in an unstructured writing task. However, during the unstructured writing task, the number of events and the number of word used were comparable to those of the control group. Finally, the execution of writing movements was inadequate in comparison to those of the typically developing children. Although the pessimistic view may be that children with Down syndrome are not able to achieve appreciable results in school skills, our findings attest proficient capacities in some aspects of writing abilities in this group of children. 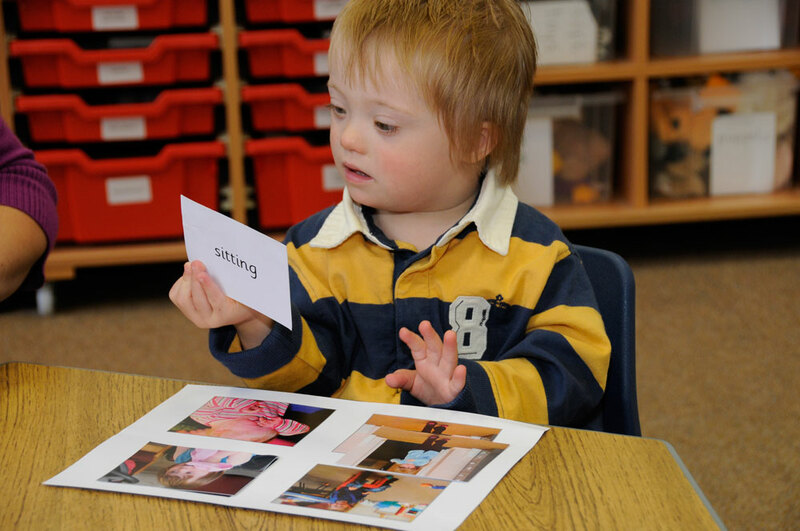 Many children with Down syndrome currently have difficulty learning adequate number skills in the classroom to prepare them for everyday life in the community. New techniques based on a visual approach to the number system (Numicon) offer a potential way to improve the practical number skills of children with Down syndrome. Given their specific strengths in visual learning Numicon should be an effective aid to learning for children with Down syndrome. The aim of this project was to conduct an in-depth evaluation of the Numicon system as a tool for teaching number skills to children with Down syndrome, and to suggest practical ways to improve its implementation with these children in the classroom and at home, including any adaptations that would be required. Results from standardised measures and observational data from the first year of the study will be reported from 16 children with Down syndrome (aged from 5 to 14 years at the start of the study) who are being taught using the Numicon approach in school. In addition feedback from teaching staff will be presented, which highlights the advantages and limitations of using this technique with children with Down syndrome. In this poster, we describe "Integrated Treatment", an intervention approach designed to improve the speech intelligibility and communication skills of children with Down syndrome. Integrated Treatment" (IT) combines evidence-based practice in speech and language pathology with literacy and performance-based activities. We will describe: (1) IT and provide a rationale for its application to children with Down syndrome; 2) the treatment strategies used in IT, such as, using scripts, pairing speech and movement, slowing speech rate, increasing volume, and providing visual support (e.g., pictures, printed materials, books); and, 3) how IT is conducted within the context of book reading, movement, music, and creative dramatics. We will report the treatment outcomes for seven boys with Down syndrome who participated in a three-week program utilizing the Integrated Treatment approach. Prior to the program's onset, one to four treatment goals for each participant were established based a comprehensive evaluation of his communication skills and his parents' priorities and goals. We then used authentic and dynamic assessment to determine which input and output facilitators would promote each participant's speech intelligibility and communication. We designed performance and literacy-based activities at the participants' level of success and then systemically increased the complexity of the tasks. Performance data were collected through out the program. All participants' target behaviors increased in frequency by the end of the program, as measured using goal attainment scaling. The 'Test of Basic Motor Skills for children with Down syndrome' (BMS) has recently been developed as an evaluative and 'condition-specific' instrument to measure the development of basic motor skills of young children with Down syndrome (0-3 years) and to provide guidelines for intervention. Objective. The aim of the study was to examine the responsiveness of the BMS. Method. 41 children with Down syndrome (0-2 years, N=21; 2-3 years, N=20) participated in this study. Basic motor skills were assessed at three moments in time with a baseline interval of two weeks (T1-T2) and a 'change' interval of 16 weeks (T2-T3), using the Gross Motor Function Measure (GMFM) and the BMS. Internal responsiveness of the BMS was measured by: 1) Guyatt's Responsiveness Index (GRI) and 2) testing the hypothesis that the increase of BMS scores in the younger group (0-2 years) was larger than those of the older group (2-3 years) as tested by a 2 Time (T1, T3) x 2 Age-group (0-2 yr, 2-3 yr) ANOVA. The GMFM was used as reference to determine the external responsiveness of the BMS. Responsiveness to change of the GMFM has been reported earlier in children with Down syndrome (Palisano et al., 2001). A 2 Time (T1, T3) x 2 Instrument (BMS, GMFM) ANOVA was applied to determine differences in responsiveness between both instruments. Results. The responsiveness of the BMS was large (GRI=2.32). A significant interaction effect on the Time x Age-group ANOVA showed the BMS scores increased more for the young group compared to the older group [F(1,37) = 8.37, p<.01]. No significant interaction for Time x Instrument was found, indicating that the BMS did not differ in responsiveness from the GMFM. Conclusion. The BMS is sensitive to changes in basic motor skills of children with Down syndrome 0-3 years of age. Background Although reading abilities play a fundamental role in the acquisition of real personal autonomy, most of the studies investigating these abilities in Down syndrome are aimed at defining educational or rehabilitation acquisition. However, the sporadic studies that describe the relationship between reading and phonological awareness in individuals with Down syndrome contain some limitations and are often controversial in method and results. The aim of this study was to explore reading and phonological awareness skills in a group of Italian speaking participants with Down syndrome Methods: Reading and phonological processing ability tests were administered to 17 individuals with Down syndrome and 17 typically developing children. The two groups were matched on the basis of reading age, using accuracy and speed of execution on an isolated word taken from the Battery for Evaluating Dyslexia and Dysorthography (Sartori, Job & Tressoldi, 1995). Results The participants with Down syndrome demonstrated reading abilities that were comparable to the control group for passage reading and for irregular word; however, they failed in non-word reading and interpreting non-homographic homophone words. Also, passage comprehension was limited. Regarding phonological awareness, lower performances on several tasks such as rhyming, deletion and syllable segmentation were shown by the individuals with Down syndrome. Conclusions Individuals with Down syndrome show a particular failure in a task such as non-word reading where correct decoding is only partially influenced by lexical access or semantic context. Correct non-word reading mainly requires the use of the grapheme-phoneme conversion process, which, in turn, is based on the efficiency of phonological awareness abilities, which is partly impaired in people with Down syndrome. The rehabilitative implications of these findings are discussed. Research has explored neuropsychological features of people with intellectual disabilities, but there are few studies on numerical and computational skills. The current study analyses performances in number and calculation understanding of a group of 16 individuals with Down syndrome with chronological age range: 12.7 - 30.3 years and mental age range: 5.0 - 6.7 years. Their performance were compared with normative data collected from Italian typically developing children. The presence of prerequisites of number skills was controlled for first using the PR-CR test (Lucangeli, Molin, Poli & Cortesi, in press). In order to investigate number and calculation skills, the sixteen participants were tested on the AC-MT standardised test for primary school (Cornoldi, Lucangeli & Bellina, 2000) and, to study reading and writing abilities in detail, on three tasks drawn from BDE set (Biancardi & Nicoletti, 2003). Our results show that individuals with Down syndrome, despite an highest level in reading numbers (up to thousands), perform significant lower than typically developing children especially in number exercises (e.g. representation of numerosity) involving a semantic codification. In contrast, computational skills seems to be partially acquired, particularly using strategies such as counting on fingers and using a pocket calculator. A major factor in this is likely to be the numeracy training that the students had been receiving: with this in mind, the present results could provide useful theoretical elements for understanding Down syndrome and offer important suggestions for future educational programmes. Background: Several studies have reported that the development of young children with Down syndrome is delayed both with respect to mental and, in particular, motor function. As children grow older, their role in carrying out self-care activities increases. Although severe functional limitations in school-aged children with Down syndrome are uncommon, they do have problems with complex self-care. These limitations in daily life activities may either originate from their specific motor disabilities or they may stem from limitations in mental ability to adequately carry out such complex activities. Objective: To examine the contribution of motor ability and 'performance' mental ability on functional (in)dependence in children with Down syndrome. Subjects: 65 children, selected by the Dutch Down Syndrome Foundation, were asked to participate in the study. Informed consent was given for 25 children (age 6;10 years; range 5;7-7;9 years) to participate. Method: A structural equation modelling approach was used to test the relation between functional status, motor ability and performance mental ability. Functional status was assessed with the Pediatric Evaluation Disability Inventory (PEDI), motor ability with the Movement Assessment Battery for Children (M-ABC), and mental ability was assessed with the Gross-Form Board (GFB). In particular, the GFB taps planning and spatio-temporal abilities, and memory. Data were analysed with the programme AMOS using the Bollen-Stine bootstrap method, Chi2-test, and NFI index. Results: Pearson Chi2-test (Chi2 = 1.35, df=4, p=.85), and NFI-index (NFI=.985) indicated that the fit of the model was good. 'Functional status' explained 70% of the variance in the model. Standardized regression weights indicated that motor ability was a far better predictor of functional status than performance mental ability (.96 versus .17). Conclusions: Limitations in functional activities of 5-7 years old children with Down syndrome seem to be more related to the level of motor ability than to the level of performance mental ability. It is known that musical abilities are developed as a part of the general symbolic function. Music skills can, therefore, be viewed as part of a general symbolic function, which can be expressed in different ways. Each of these forms of expression and each of these systems are interrelated and affect each other. A child's actions, perception and feelings transpire through his words, melodies, rhythm or drawings. As the child's ability to use symbolic media grows, his emotions become enriched. The nature of musical experiences is, actually, simultaneously cognitive and emotional. The programme lasts two years and is carried out two times a week with 10 children with Down Syndrome aged from 6-10 years.Activity plan:We took into consideration the developmental stages in music perception: perception of sound height; recognizing rhythm; intensity perception; recognizing melody. Our method follows stages of the child's song acquisition: first words acquisition, then rhythm and the basic beat of the song, small rhythmic-melodic phrases, which are to be integrated in bigger musical units, or music units. Expressing basic feelings and emotions through music: with their own voice, gestures, through mimicry, by movement and playing traditional and simple contemporary instruments. Listening and taking part in small drama music pieces acting out situations, people and objects, while at the same time discovering the musical dimension. Even though this programme is still being carried out, the results show that all the children have acquired the basic musical abilities. They are able to play the C-dur scale; all the children can play a short composition on the piano and have learned the basic rhythm. The development of musical abilities has increased the frequency of usage of communicative, both verbal and non-verbal abilities. Furthermore, younger children have shown a larger attention scope and short term verbal and non-verbal memory.